The daily reality of life for children with disabilities and their families is frequently one of discrimination and exclusion, in all countries of the world. We find it unacceptable for any child to be treated differently because of an intellectual or physical impairment. With commitment, dignity and love, all children must be allowed to reach their God-given potential. 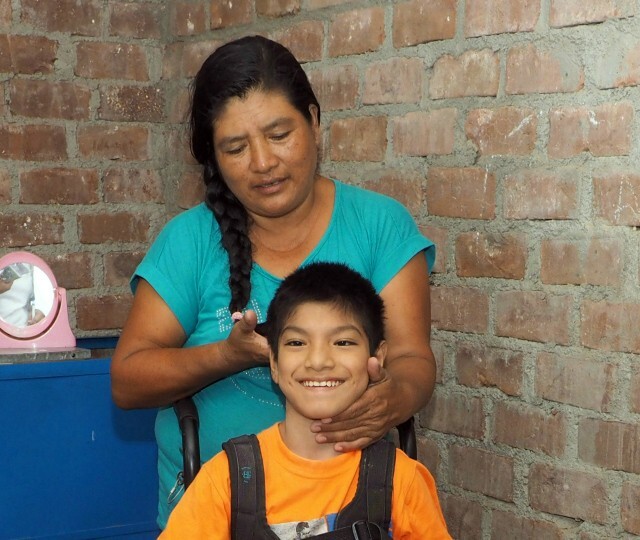 Raul is only 12, but the therapists at CMMB’s Rehabilitation with Hope program in Trujillo, Peru nicknamed him “Old Man.” Raul laughs every time he hears it. When the therapy team first met Raul, he was curled into a ball. He couldn’t hold or grab anything. With commitment and persistence, Raul can now sit up, open his fists and say a few words. Next step – to get him standing! Sadly, Raul’s father blamed his son’s disabilities on his mother, Alejandrina. While the father supports the family financially, he doesn’t help raise or care for Raul and his three siblings. Our therapy team in Peru says that within Rehabilitation with Hope, approximately 65% of fathers of children with disabilities abandon their families. In especially poor countries like Peru, children born with disabilities and their parents face multiple obstacles, including lack of education, negative attitudes and stigma, and services that are often inadequate or nonexistent. Together, we can impact the lives of children with disabilities, addressing their right to survive and thrive.